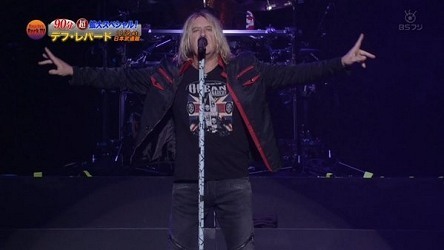 A new 90 minute special on Def Leppard is currently being shown on BSFuji TV in Japan and featured live footage. Masa Ito's 90 minute Rock TV/Rock City special started within the last hour or so in Japan on BSFuji TV. It has so far featured a pro shot live version of 'Let's Go' from the Tokyo show on 9th November at the Nippon Budokan. Interviews are also being featured with Joe, Phil in a hotel and a separate one with Vivian that looks to be from backstage at the venue. Local fans have already posted many screenshots from the show which you can see below. Hopefully footage will surface online (and some already has). The translated link below suggests 'Let's Go' might be the only live footage used. Joe appeared on the same show in November 2002 which included live footage of 'Ring Of Fire' and 'Now' during the X/Ten tour. Visit the Tokyo show page to view the setlist of the band's 9 song soundcheck. It is included on one of two high quality live recordings to have surfaced from the show. The band played 'Dangerous' twice and also rehearsed 'Paper Sun' and 'Promises' - both unplayed in a show since the US tour.